"Older horses are becoming an increasingly important component of the horse industry. This presentation will describe the clinical problems associated with PPID as well as summarize current knowledge about the cause of PPID in horses. We will also discuss recommended approaches to diagnosis, management, and treatment of affected horses as well as take a look at case examples. Wade is one of three TREES residents diagnosed with Cushings Disease. 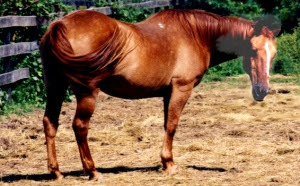 Lordosis, however, is not seen only in old horses and broodmares. 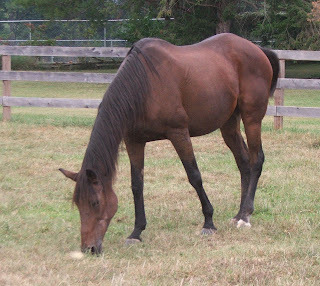 According to University of Kentucky's Dr. Patrick Gallagher, horses likely to develop lordosis are born with a certain skeletal structure that predisposes them to the condition, even as foals in some cases. Dr. Gallagher also found that, while dogs and humans are severely disabled by lordosis, horses are not affected in the same way. For more, visit All About Horses. Traveller's Rest is a non-profit sanctuary for senior equine that have been victims of neglect or abandonment, or who owners experienced hardships making specialized care difficult. All proceeds will go directly toward feeding or providing veterinary, dental and farrier care to these special horses. or bring them on October 20 when you come to browse the All Treats, No Tricks Sale! Though there have been localized rain showers in the area, this particular farm has not seen any measurable rain since mid-April. The most obvious result of no rain, easily noticeable as visitors enter the driveway, is the dead, brown pasture. As of this week we are feeding almost as much hay per day as we normally feed in a mild winter. The problem with that is two-fold. First, we are using hay we would usually reserve for winter forage. Second, a larger annual hay requirement translates into a larger annual economic consideration. Obviously, the more bales of hay we buy, the more money it costs. There is, however, another factor at work. Many area farmers were able to produce only a fraction of their normal crop during the early summer cutting and will not be able to harvest a second cutting at all. This smaller supply of hay will mean higher prices, if we can find adequate supply at all. The lack of tender, second cutting hay will be particularly hard on our dentally challenged Elders who cannot manage the coarse stems and stalks that make up much of a first cut bale. We do have the option of buying bagged chopped forage or forage cubes, but the bottom line remains this same. Basic care costs could be much higher than usual this winter, not only for TREES, but also for all local horse owners. Rescue facilities and sanctuaries can expect increased number of requests to take in horses this winter. In addition to the grass and hay issue, the dry weather has other effects on TREES’ Elders. The most troublesome problem is that the ever-present dust is causing bronchial inflammation in at least two of our geldings. Jubal and Sonny both have diminished air movement through their lungs. To combat the dust somewhat, we are dampening bedding and shed floors once or twice a day, depending on drying time. This may help some, but it does not address the fact that just walking across the fields, the horses kick up a little dust with each step. If there is no relief soon, the next step will be to administer a bronchodilator to help Sonny and Jubal breathe easier. Under the layer of dust, the ground is almost as hard as concrete. As a result, the horses with arthritis and ringbone are experiencing more aches and pains. Stalls and sheds are being deeply bedded to give the Elders more comfortable places to stand or lie down. More pain management medication is required than usual as well. One up side to the dry conditions is that we are seeing far less mosquitoes that usual. All in all though, we’d take the mosquitoes if they came with more grass and hay. Now, this is what we'd like to see! We found this little guy at the end of our driveway last night. All alone. This wee kitten seems clean, healthy, well-socialized and energetic. It is unlikely he was on his own for very long. It also seems unlikely he wandered here on his own at 5-6 weeks of age. This may be somewhat off-topic for a horse sanctuary blog, but dropping dogs and cats off in the country is not in the animals' best interests. If you cannot find homes for them yourselves, please be responsible and take them to a shelter or adoption agency. There, at least, they have a chance of finding new homes. Being "free in the country" offers pets more chances of confronting dangerous situations than of finding safe homes. This kitten was lucky. He was noticed and scooped up yards from a busy road where traffic often travels at 60 mph. Please have your pets neutered. If you feel you have a saving-the-planet caliber reason to allow your pets to breed, please, please take responsibility for the offspring. There are too many options available to resort to "setting them free" in the country. Their "freedom" will likely be short-lived. A few days ago, we promised to introduce another of our special residents, The Belle of Ellwood. 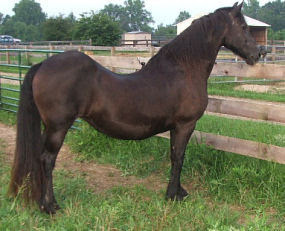 “Belle” is a 33-year-old Arabian mare. While we know she was once known as “AB Kareemah,” we don’t know much of her history. She has, from what we’ve been told, borne quite a few foals in her day and may have worked as a therapy horse for a short time. Scarring on one hind leg indicates Belle may have run into some bad luck some time in her mysterious past, but we don’t know what type of injury she suffered or when the accident occurred. One other thing we know about Belle is that she lived in Orange County, Virginia for the past several years, just off of Route 20. Hence the name, Belle of Ellwood. Ellwood is an eighteenth century plantation home, also located on Route 20 in Orange County, Virginia. Built in the 1790’s, Ellwood was once a typical, bustling Virginia farm. During its early days, the home at Ellwood hosted such guests as The Marquis de Lafayette, “Light Horse Harry” Lee, and James Monroe. In later years, unexpected guests such as Ulysses S. Grant and Ambrose Burnside occupied the property. To this day, the family cemetery at Ellwood is known as the final resting place of Thomas “Stonewall” Jackson’s arm, amputated following the Battle of Chancellorsville, just up the road. Following the Civil War, the farm stood vacant for a time. Though the owners resumed life there in the 1870’s, and the property changed hands only a few times since, by the 1980’s Ellwood was badly deteriorating. Since then, the National Park Service and Friends of the Wilderness Battlefield worked to stabilize the home’s structure and continue working toward further restoration. “Restoration” is how we view Belle’s reason for arriving at Traveller’s Rest. It was been a longer road for Belle than for most of our residents. She has been slower to regain weight and slower to find her niche in the other horses’ social structure. Recently, however, Belle turned a corner. While we believe she will always have some weakness in her hindquarters due to apparent previous injury and arthritis, she is putting on weight and regaining a healthy coat. On her road to her former grandeur, The Belle now spends her days with a trio of geldings, Wade, Val and Sonny, dividing her time equally among the three. Our hope is that she will continue to gain weight as we go into fall, better preparing her for winter. Belle’s progress has been slow, but it has been steady. Welcome home, Belle. We hope you find the accommodations to your liking and that you will stay quite a while. One of the most common physical maladies faced by TREES' residents is, of course, arthritis. Some residents are afflicted as a result of overwork, some because of previous injuries, and some become arthritic as joints change during normal aging processes. More often than not discomfort can be managed through the use of joint supplements and attention to details in the horses' living quarters and turnout areas. 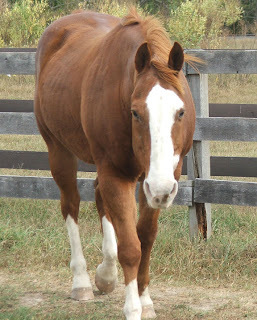 For some horses, however, there comes a time when symptoms of arthritis must be managed with medication. The most commonly used drug, for many years, has been phenylbutazone, or "bute." Bute is very effective, but also has well known side effects, such as damage to the gastrointestinal tract and kidneys. During the past several weeks, it became apparent that our Grand Old Man, Jeb, a 40 year old Tennessee Walker gelding was becoming more uncomfortable. Joint supplements and management techniques alone were not controlling his arthritis pain. In cases like Jeb's, where the choice is to use bute and risk its side effects, or euthanize a horse because its pain cannot be managed, we have used bute. As of July 5, 2007, however, we have another choice. 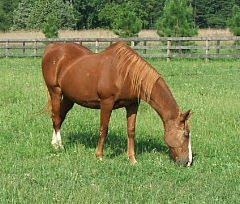 The FDA, on that date, approved a COX-2 inhibitor sold under the brand name Equioxx, for the treatment of arthritis in horses. Traditional NSAIDs such as phenylbutazone (Bute) and flunixin (Banamine), inhibit both COX-1 and COX-2. These drugs are known to cause ulcers, gastrointestinal bleeding, and kidney damage with prolonged use or high doses. COX-2-inhibiting drugs, including firocoxib and the human drugs Vioxx (rofecoxib) and Celebrex (celecoxib), selectively inhibit production of the inflammation-causing COX-2 enzyme, leaving the COX-1 enzyme free to perform its protective functions in the gastrointestinal tract and kidneys. "On the equine market we've got the standard old NSAIDs, Bute and Banamine," said Anthony Blikslager, DVM, PhD, associate professor of equine surgery at North Carolina State University's College of Veterinary Medicine. "They're very effective for the control of pain, so they have very good efficacy. But the trouble is, they could be safer. "I would hope that using a COX-2 inhibitor--if they can show that it's as effective as Bute--would still be safer because even though horses have overlapping function of COX-1 and COX-2, as compared to other species, you would still be leaving one of the enzymes alone to maintain organ function," Blikslager said. Jeb received his first dose of Equioxx yesterday. At this point, we can say that he does appear more comfortable and ate breakfast well. He is more interested in what goes on around him, and the dull look in his eye is gone. There is no predicting what the future will bring, but its good to have another weapon in the anti-arthritis-pain arsenal. As a sidenote.........we'd like to publicly acknowledge Drs. Carrie McColgan and David Licciardello of the Rappahannock Equine Veterinary Clinic in Locust Grove, VA. TREES' elders are examined, evaluated and treated with the same thorough care and attention to detail as high-dollar show horses. We also feel that we always have their support in trying new techniques and products to further our education in geriatric horse care, and the more we learn, the more we can pass on to other elders' owners. And so, we begin a trial of yet another new option. We'd like to hear others' experiences with Equioxx in the comments section, once you've had time to give it a fair trial. We are often asked about the motivation to open a sanctuary for elderly horses. "Why focus so much energy on horses at the end of their lives?" "Why spend so much time and money on horses who can no longer be ridden?" "What made you want to do this work?" THIS made us want to do this work: Meet Gypsy. More formally, Dame Gypsy Rosalee la Paramour. 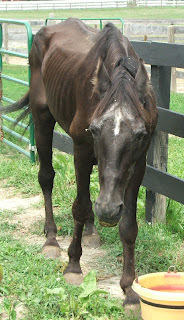 Gypsy arrived at the Equine Rescue League, where I volunteered at the time, as a skinny, depressed 35 year old, having no use for the human race who had let her down in every way. There was nothing magical about our relationship at first. She wanted no attention from me and I wasn't interested in talking her in to liking me. Slowly..........painfully slowly.........we each grew to respect the other's personality quirks and likes and dislikes. Gypsy came out of her shell, bit by bit, and allowed me into her life. From there, the magic blossomed. The big mare with the attitude problem would stand for hours, if you'd oblige, to be groomed, scratched, bathed, and otherwise beautified. She would, quite literally, fall asleep if the scratching happened to be in just the right place at just the right speed with just the right pressure. She tolerated all sorts of decorations for ERL Open Houses and seemed particularly pleased to wear anything with bells on it. For some odd reason, Gypsy also enjoyed the Armour Hotdog Song. Taste in music aside, it was Gypsy who taught me to respect the dignity and wisdom of the Elders. If I did anything she considered vaguely stupid, she had a way of looking at me over her shoulder than said it all. "Don't do that again. I'll give you one more chance. And you know I don't give second chances often." On the other hand, on days I wasn't feeling quite up to par, she was right by my side, nuzzling, giving "neck hugs," and on her best behavior. 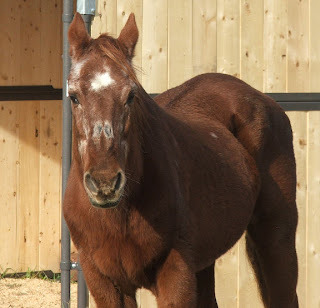 The mare who was so emotionally damaged on arriving at ERL was herself becoming a caregiver. Dame Gypsy eventually became the alpha mare in her field and ruled with an unquestioned authority. A small change in posture or in the carriage of her head brought immediate response from the most unruly youngsters. Watching her carry out her duties was a lesson in handling improper behavior. Remain firm, but show no anger. The photo above was taken when Dame Gyspy was 36 years old. She subsequently lived another three glorious years, large and in charge, as Herd Matriarch, before leaving us with a huge hole in our hearts. Though we've had special relationships with other horses since then, none could fill the void left by la Paramour. It is to her and to her successor, an Appaloosa mare called Mystic, that we dedicate Traveller's Rest. "Turn 'em in with ours, and kick for the river," girls. Very special gratitude to all who donated tack, books and sale items of every imaginable type. Residents of Spotsylvania, Fredericksburg, Northern Virginia and surrounding areas are unquestionably some of the most generous on the East Coast. TREES received sale goodies ranging from brand new or barely used items to well loved and impeccably cared for vintage treasures. Without you, the sale would have been far less successful. 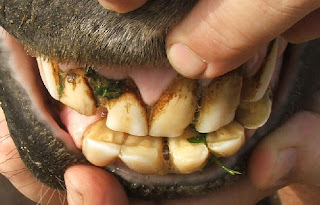 Funds raised will go toward dental exams for all of our vintage horses, to include treatment where needed. In anticipation of future sale events, TREES will happily accept yard sale items, tack, stable supplies and books at any time during the year. Thank you again to all who participated. We look forward to seeing everyone again soon! 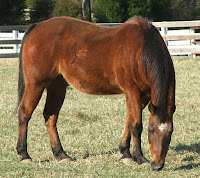 Most people associate senior horses' weight loss with the winter months. Many elders, however, have problems maintaining healthy weight during the summer. It was Sonny, our 36 year old Palomino gelding, who finally pointed us toward a solution. After applying yet another "guaranteed" fly repellent to Sonny's legs last summer, we watched in amazement as flies resumed their attack before the spray was thoroughly dry. Sonny stomped and paced and rubbed his muzzle on his legs. This old man was working off precious calories before our eyes. For reasons we do not yet understand, flies seem to be attracted to the lower legs of "frail" horses more than they are attracted to other parts of the body or to more robust animals. One possible reason is that many of these horses are dentally challenged and eat "mush" which they then wipe on their legs while trying to shoo flies on their own. No amount of wiping, washing, currying or brushing seems to remove the microscopic morsels that brings flies running. .......fly boots work wonders! The first time we asked Sonny to wear boots, he stood quietly as we adjusted the velcro straps. As soon as the stall door opened, though, he launched into the air and bucked his way into the sunshine and down the length of the field (MYTH: Old horses are "bombproof". REALITY: They are not any more bombproof than horses in other age ranges.) By the end of the day he realized how much more comfortable he was and now stands at his gate after breakfast waiting for his "booties" before returning to the field. Maintaining his weight is no longer a problem. Many of TREES' residents wear fly boots now. (Boots are removed at night.) Even horses who did not appear to be overly stressed by flies seem more content and require less feed to maintain a healthy weight. Yes, getting everybody "dressed" in the morning takes a few extra minutes, but the results are worth every second. *dropping more food than previously. *eating more slowly than before. 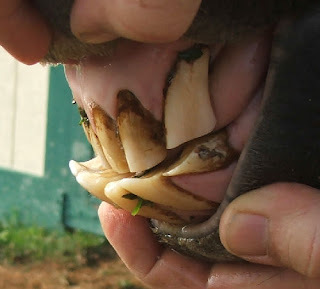 If you notice any of these signs of developing problems, contact your veterinarian or equine dentist as soon as possible. As with human teeth, preventing the progression of trouble is much easier than correcting problems at a later time! Traveller's Rest will have a Book and Yard Sale July 14, 2007 from 9AM until 3PM to benefit its special residents. TREES is currently accepting clean, gently used yard sale items, tack, stable supplies and equipment, and pre-owned books of all genres to add to the sale. All proceeds from the sale will be used to feed and care for current residents and to help educate owners of senior horses on special care considerations. 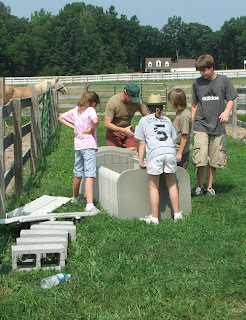 If you have items to donate to the sale, please contact Traveller's Rest at info@equineelders.org or call 540-972-0936. 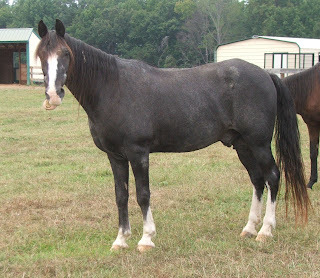 Owners of senior horses often ask us when they should retire a horse from riding. There is no single answer to that question. As long as a horse is comfortable, in good health, and willing he can work as long as he likes. After 30 years on the job, a 43 year old Quarter horse gelding named Tuffy is still working as a therapy horse at Edmonton's Whitemud Equine Learning Centre in Alberta, Canada. Tuffy's owners retired him a few years ago, but the old workhorse became depressed and stopped eating when he could no longer work with disabled children via the Little Bits Therapeutic Riding Association. He currently works one hour a day, four days a week and will continue to do his job as long as he remains in good health. Tuffy was named Canadian Therapeutic Horse of 2005. Read the Edmonton Sun article about Tuffy's work. Traveller's Rest will have a Book and Yard Sale in mid July to benefit its special residents. Specific date and times to be announced soon. TREES is currently accepting clean, gently used yard sale items, tack, stable supplies and equipment, and pre-owned books of all genres to add to the sale. All proceeds from the sale will be used to feed and care for current residents and to help educate owners of senior horses on special care considerations. If you have items to donate to the sale, please contact Traveller's Rest at info@equineelders.org or call 540-972-0936. For the next several days, email is the preferred method of contact. Friday's storm disabled one telephone line and the answering machine. We should be back to normal communications by Thursday June 14. Some additional notes regarding the June 4, 2007 post. 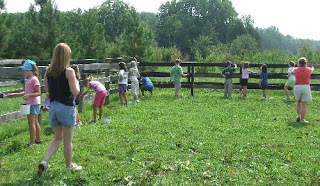 Although the Equine Rescue League has been in Leesburg, VA for almost 17 years, they are very willing to consider farm properties in other areas of Virginia. The current farm must be completely vacated by Sept 22, 2007, which means they need a new facility before that date to allow time to move approximately 30 horses, some portable sheds, equipment and supplies. This, however, is a breakthrough moment for both of these horses! 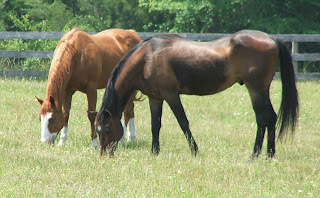 Val, the dark brown Thoroughbred on the right, has never been welcoming of other geldings in "his" field. At the same time, Wade, the sorrel Quarter Horse on the left, has been a loner since his arrival, usually staying far removed from other horses. We have no idea what happened over the past few days, but it looks like things have changed for both boys! Hopefully, this will be a lasting friendship. Our apologies for the absence of Traveller's Rest News. We're back and will once again begin providing regular updates. The Equine Rescue League needs your help. Please contact the Equine Rescue League office at 703-771-1240 if you can help them continue to help horses like those mentioned below. We can't afford not to. 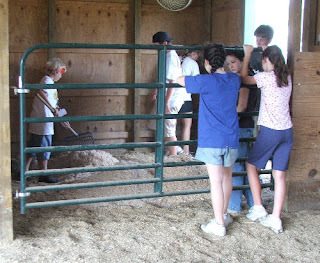 The Equine Rescue League, in Leesburg, Virginia is one of the oldest equine welfare groups in this part of the country, founded in 1990. ERL's founder, Pat Rogers, prior to opening this particular facility was the Farm Manager of the American Horse Protection Association's farm in Lucketts, VA before AHPA closed the farm and became more of a lobbying group. Pat had experience at this before most of the rest of us even heard of "horse rescue." She also attended auctions with Gail Eisnetz (author of Slaughterhouse) back in the 80's so was (and is) very committed to this mission. 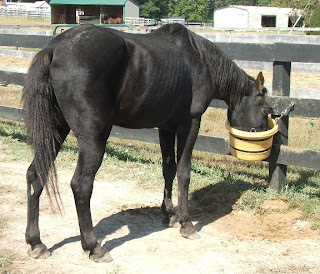 ERL, in its first year of operation, took in a herd of 32 neglected Morgans from a case prosecuted in a nearby county. The owner received the harshest punishment ever given for a cruelty case at that time. The community rallied at that time, providing funds, supplies, and volunteer labor. If not for that support, caring for 32 starving (and many pregnant) horses would have been next to impossible. In later cases, one involving 19 Appaloosas arriving at one time, one involving several starved foals only a few months old, and one case that inspired all who visited........The Gold One........the community again came together and helped ERL provide intensive care. At other times, arrivals were not as dramatic, one horse here, two there, but ERL was always there, plugging away feeding, watering, treating injuries and, sadly, offering peaceful ends to those for whom help came too late. 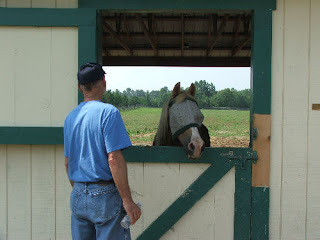 ERL set the stage for most of Virginia's other equine rescue operations. They've allowed many of us to adapt their contracts, for example, for our own use rather than making us reinvent the wheel. They've done more than most people realize to raise awareness of equine humane issues. Now, Their occupation of Churchland Farm, which has always been a temporary arrangement, is coming to an end. Loudoun County, one of the fastest growing in the nation, must reclaim the property for landfill expansion. ERL has until September 22, 2007 to find a new home. In an area of such rapid development, land prices have skyrocketed over the last 5 years. The current market is not one easily entered by a charitable organization whose primary mission.....caring for neglected horses.......puts every donated dollar to immediate use. Saving the amount of money needed to purchase suitable acreage has been difficult. Its time to rally the community again. ERL and its residents need your help. The organization is asking for your assistance in procuring a property, raising funds, and soliciting donations or grants. Please help them continue their work in Virginia. Losing this groundbreaking organization that led the way in the area would be a tragic occurrence. With no ERL, there would have been no Flower, no Bob, no Churchill, Goldie, or countless others. Although the Equine Rescue League depends on volunteers and private donations to help horses in need of our services and to maintain its farm shelter, the real heroes of our stories are the horses themselves. Regardless of past mistreatments or abuses, these horses continue to trust, and even like, people. Each one seems to believe that the next stage in its life will be better than the last; that the next caregiver will treat him with kindness and respect. 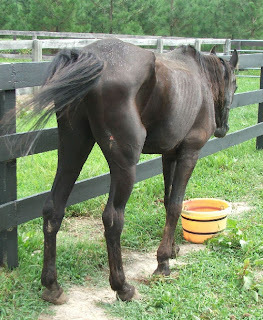 It is always inspiring to see how quickly a horse can recover from total neglect once appropriate care is administered. The convalescent period is tackled with a "gusto" not seen in most human patients. These pages are dedicated to those victims who would not resign themselves to an unpleasant fate. How can we give up when they do not?